"Liberators" Murder More Iraqis Than "Insurgents"
Coalition troops and Iraqi security forces may be responsible for up to 60% of conflict-related civilian deaths in Iraq – far more than are killed by insurgents, confidential records obtained by the BBC’s Panorama programme reveal. Again, more proof that what we see on our tellies is pure US government propaganda. Ask the average Brit who’s causing the current mayhem in Iraq and they’d surely answer “insurgents” since this is what our mass media is screaming. Shame it’s not the truth, eh? Still, we can’t let the truth get in the way of Bush’s Crusade to liberate the oil er… oppressed people of Eyerak. Of those deaths, 60% – 2,041 civilians – were killed by the coalition and Iraqi security forces. A further 8,542 were wounded by them. And that’s just in the official figures kept by the US-installed puppet regime! Excluding “insurgents.” Who are insurgents? Why, anyone who dares to oppose the will of Bush and his cronies. These deaths don’t even merit counting. So all those buildings flattened by the US military because they were suspected insurgent safe houses, the people murdered in those buildings aren’t even included in these figures. No trial, no charges, no justice, just summary execution by the US invaders. WASHINGTON — From 1970 to 1973, the United States sought to overthrow the government of Chile and its democratically elected president, Dr. Salvador Allende, whom it deemed a Marxist threat to U.S. interests. Under orders from President Richard M. Nixon, the CIA mounted a full-tilt covert operation to keep Allende from taking office and, when that failed, undertook subtler efforts to undermine him. Those efforts “never really ended,” the CIA’s director of operations at the time, Thomas Karamessines, later told Senate investigators. Twenty-five years ago last week, on Sept. 11, 1973, the Chilean military seized power, The junta, under Gen. Augusto Pinochet, ruled until 1990. Its death squads murdered more than 3,000 people, and it jailed and tortured thousands more. Chile is still trying to come to terms with the damage done to its democratic institutions. They show how much the United States was committed to thwarting Allende even before he took office, and they illustrate a fact that was not well understood during the Cold War: The CIA very rarely acted as a rogue elephant. When it plotted coups and shipped guns to murderous colonels, it did so on orders from the president. The US government doesn’t care about democracy. It cares purely about how much power it can exert over any regime. It would rather have a friendly dicatator than an independent democracy. Soon thereafter, Donald Rumsfeld (who had served in various positions in the Nixon and Ford administrations, including as President Ford’s defense secretary, and at this time headed the multinational pharmaceutical company G.D. Searle & Co.) was dispatched to the Middle East as a presidential envoy. His December 1983 tour of regional capitals included Baghdad, where he was to establish “direct contact between an envoy of President Reagan and President Saddam Hussein,” while emphasizing “his close relationship” with the president [Document 28]. 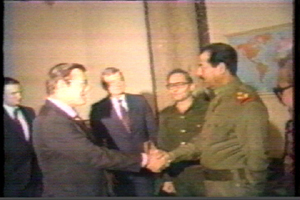 Rumsfeld met with Saddam, and the two discussed regional issues of mutual interest, shared enmity toward Iran and Syria, and the U.S.’s efforts to find alternative routes to transport Iraq’s oil; its facilities in the Persian Gulf had been shut down by Iran, and Iran’s ally, Syria, had cut off a pipeline that transported Iraqi oil through its territory. Rumsfeld made no reference to chemical weapons, according to detailed notes on the meeting [Document 31]. Everyday there is more bloodshed and horror in Iraq. Whether the people doing the killing are the invaders or the terrorists, it’s ordinary Iraqis paying the price with their lives. The roots of this current nightmare go a long way back, at least 22 years to the picture above (and that’s not including the British meddling) . The horror is the product of US machinations in the Middle East, supporting murdering scum like Hussein as long as he played ball. Look at the history books. Look at the US government’s policies in Vietnam, Korea, Cuba, Nicaragua, Chile, El Salvador, Grenada, Afghanistan. The US ruling class aren’t interested in ideals like democracy and freedom. Like any ruling class anywhere, they’re only interested in two things: power and money.